Nations gathering at the Friends of Syria meeting called for an immediate withdrawal of fighters belonging to the Lebanese militant group Hezbollah and Iran from Syria, the bloc said in a statement after a conference in Amman. The alliance described their armed presence in the country as a threat to regional stability, Reuters said. The bloc also said any transitional government in Syria being proposed as a core of a U.S. and Russian peace initiative must have authority over the army and the executive, which are now in President Bashar Assad's hands. 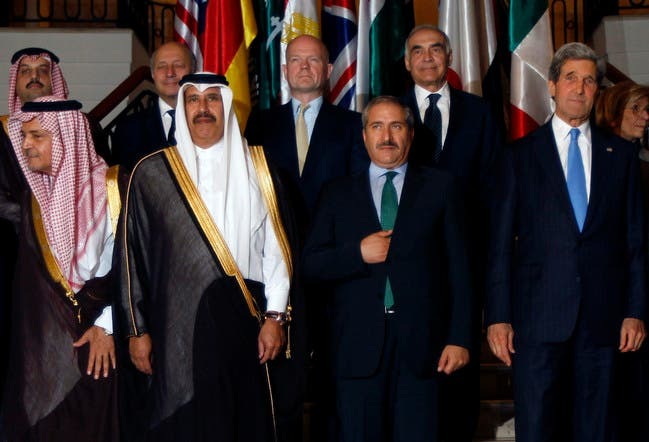 The meeting of 11 Western and Arab nations, as well as Turkey, which constitute the core group of the alliance, also warned of “severe consequences” if use of chemical weapons by Assad's forces is confirmed. The Jordanian Foreign Minister Nasser Judeh spoke during the opening session and said the aim of the talks is to develop plans for a political transition period to start in Syria. During the opening session, U.S. Secretary of State John Kerry said forces loyal to Syrian President Bashar al-Assad escalated violence in the country. The Jordanian foreign minister also added that the Syrian crisis left more than one hundred thousand as victims of war in the country until now. Earlier on Wednesday, Kerry held a press conference with Judeh in Amman. “We would call on President Assad to make the same commitment to find peace in his country,” Kerry said. Kerry said if Assad was not prepared to discuss a political solution to end Syria's civil war, it will prompt the United States and other countries to consider increasing their support to the Syrian opposition. The U.S. secretary of state also stated that Hezbollah, a Lebanese militant group, was taking part in Syrian conflict, with the Iranian support. British Foreign Secretary William Hague also said earlier on Wednesday that both Iran and Hezbollah are “propping up” Assad and increasingly supporting him. Hague said Britain would urge international powers to set a date, in the next few days, for an international conference to try to end the two-year-old conflict engulfing Syria and threatening regional stability. “It is the longstanding view of the U.K. that Assad needs to go, and we have never been able to see any solution which involves him staying,” Hague told a press conference. In a rare twist, Syrian Ambassador to Jordan, Bahjat Suleiman, has denounced the meeting of nations that back the Syrian opposition, calling the gathering part of a U.S.-Israeli campaign to destroy his country.